INDEX: Design to Improve Life® is a Danish non-profit organisation based out of Denmark, with global outreach. With the mission to encourage sustainable design solutions for global challenges, the organisation leads activities that seek to inspire, educate and foster engagement that puts conscious and responsible design in practice for real-life solutions. An important manifestation of this mission is Design to Improve Life Education, which aims to inculcate this approach in school curriculums in Denmark and Sweden. The Design to Improve Life Compass is one of the tools created under this to bring creative design process both in teaching methods and in enablement of students to devise solutions for their real-life challenges. Design to Improve Life Education from INDEX: Design to Improve Life® on Vimeo. The Compass offers interesting methods, processes and filters which educators and students in design schools (irrespective of their geographical location and age), can incorporate in their work, especially in projects concerning social, economic & environmental sustainability. 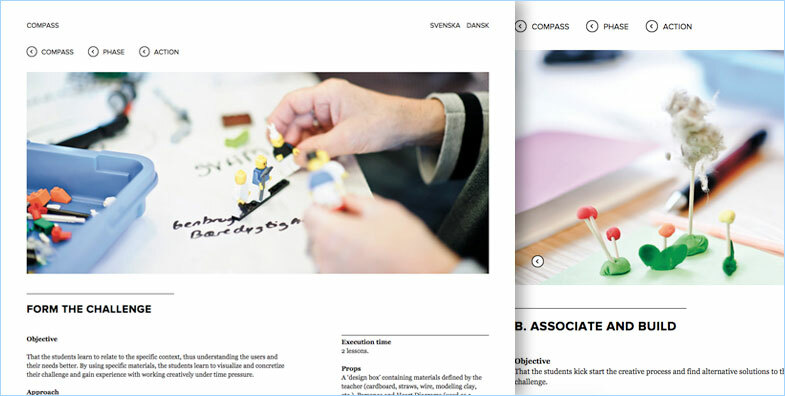 While it is relevant for both teachers and students, the Compass needs careful study and some level of experience to understand how all or parts of it can be customised or adapted for different projects for social impact. The Compass is structured with the user as the central point of focus, always reminding and anchoring activities through a user-centric lens. Four sequential phases of Prepare, Perceive, Prototype and Produce present distinct parts of the creative process. Each phase contains suggested actions, which further contain multiple ways each of implementation. A detailed overview of objectives, approach, plan, right down to time allotment for activities at every level, clarifies the utility and execution. 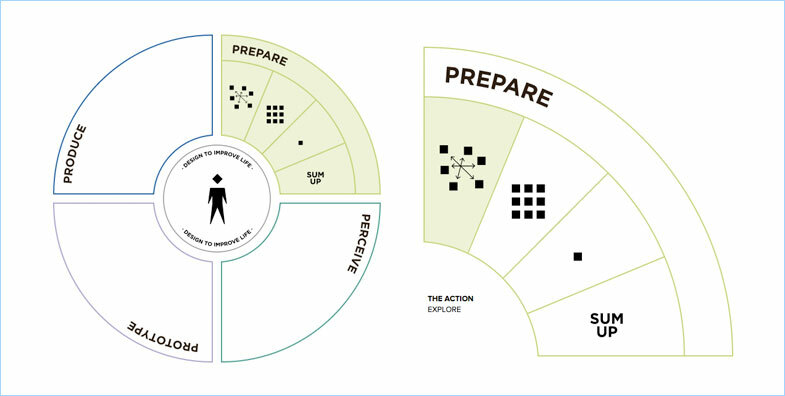 A ‘Sum Up’ action at the end of each phase, provides an important pause in the process, for reflection and better awareness before moving on to the next stage of idea development.The Compass also brings rigour to the overall process, by suggesting a 3-pronged evaluation criteria—Form, Impact and Context. For me one for the most valuable features in the entire model was the idea of Jokers. 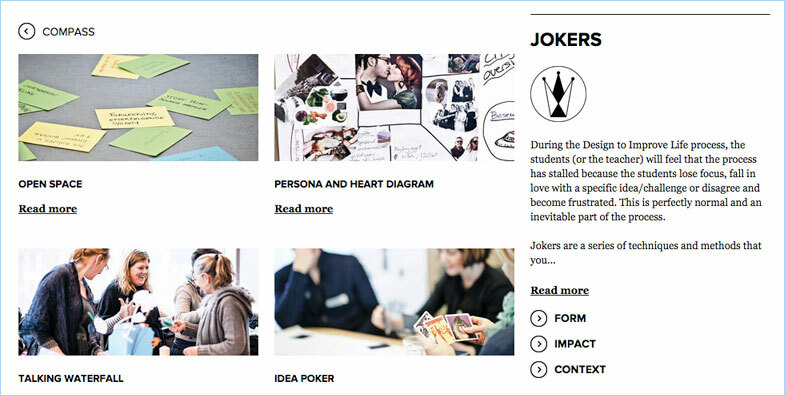 Described as ‘positive interruptions that can change design teams’ mindsets, make them change their course of direction and see new possibilities’ Jokers offers activities and processes that can tackle the inertia or heady rushes in the creative process. Despite the best of intentions and dedication, creative processes for design students (and anybody else for that matter) can often hit the wall with extremes of narrow focus or lack of focus. The idea of Jokers calls out that gap, and provides suggestions for it. The Compass may have been designed keeping in mind school children. But don’t let that throw you off. In the ideas it offers on navigating the creative process and validating your ideas, it can be helpful, especially if you are designing (or mentoring) to improve life. Check it out here. All images courtesy INDEX Design To Improve Life.